What Are Above Ground Pools Made Of? Posted on March 22, 2019 March 18, 2019 , in Above Ground Pools. The parts that are needed to put together an above ground swimming pool include the walls with a base track for them to sit in. There’s also a top track, known as a stabilizing bar, to keep the wall in alignment and provide a place for the pool liner to attach. The tracks come in sections which are connected to each other with interlocking plates called connectors. The connectors sit on top of, and beneath, the vertical posts, known as uprights, which create a basic frame. They serve as points of support and stability for the walls. Sitting on top of the top track and running between the uprights are the top rails which form the top edge of the pool. Top caps are added to the top of the uprights to cover the joints and create a smooth, almost seamless edge around the entire pool. Above ground, pools come with a vinyl liner in which to hold the water. The liner is placed inside the pool and attached to the top track. 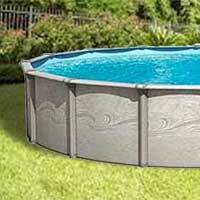 The main materials used for the various above ground pool components are steel, aluminum, resin, plastic, and vinyl. Pool walls can be made from steel or aluminum. There are pros and cons of each type of material, but the fact is that both will eventually break down over time. Aluminum will ultimately last longer than steel but will also cost you more upfront. Other factors that determine the lifespan of each material are their quality, their thickness and the type of paint or coating used to seal them. The liner that sits inside the pool walls and helps contain the water is composed of vinyl. You’ll likely have to replace your liner every 5 to 10 years. The various parts of the pool frame can be made of steel, aluminum or resin. The top caps and rails are more likely to be made of plastic or resin, while the uprights, interlocking plates, and rails will usually be made of steel or aluminum. Once again, thickness, quality, and coating of any steel or aluminum parts will affect their longevity. Keeping an eye on any rust spots or chips in the paint can prevent catastrophic failure. Now that you know what above ground pools are made of, download a brochure to learn more about our models.